Photo: Gerald Navratil, left, professor of applied physics, and Columbia research scientist Andrea Garofalo stand in front of a cross-section model of the DIII-D Tokamak fusion energy experiment at General Atomics in San Diego. "Increasing the Pressure in Spinning Plasma"
The heat of the summer months was no match for the heat and pressure produced this summer at General Atomics’ DIII-D National Fusion Facility in San Diego. In experiments that built on research done on the HBT-EP fusion device at the School two years ago, Columbia physicists in California have increased by a factor of two the threshold pressure for stable confinement of hot, ionized gases by strong toroidal magnetic force fields. Navratil and Michael Mauel, chair of the Department of Applied Physics and Applied Mathematics, are among the nation’s top scientists leading fusion science programs at General Atomics, the Princeton Plasma Physics Laboratory and MIT’s Plasma Science and Fusion Center. “This is a national effort,” said Mauel. “We are all working together to offer a very exciting research environment for students while also working to create a practical fusion energy source for the future.” Students work on the Tokamok reactor that was responsible for groundbreaking work in increasing threshold pressure of gases. With temperatures approaching 200 million degrees Celsius, fusion fuel, or plasma, must be suspended by strong magnetic fields within large toroidal vacuum chambers. During the past decade, scientists discovered that when the ring-like plasma spins within the containment device, less power must be injected into the plasma to maintain its high temperature and pressure. Unfortunately, as the pressure increases, the plasma becomes unstable and makes contact with the metal wall of the vacuum chamber. When this happens, the plasma cools immediately and must be restarted. 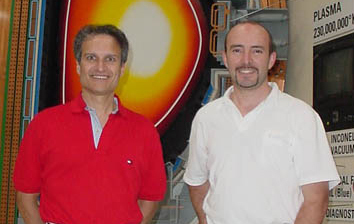 The experiments led by Mauel and Navratil on the HBT-EP device at Columbia were the first to demonstrate that, by correcting imperfections in the magnetic field, it is possible to prevent the growth of these plasma instabilities. In the new experiments at DIII-D, similar techniques were able to maintain the “spin” of the plasma by combining passive stabilizing effects of the metal wall and active control coils using a sophisticated feedback control loop. Sensors installed on the edge of the confinement chamber detect distortions in the plasma and immediately signal the magnetic coils to provide a correction that smoothes out the bumps and kinks. Dr. Garofalo reported this pioneering work in early November in an invited paper at the American Physical Society’s Plasma Physics Meeting. Photo: Students work on the Tokamok reactor that was responsible for groundbreaking work in increasing threshold pressure of gases. This story was originally published in the Fall 2001 edition of Columbia Engineering News.